The tower will include a 220-room hotel and 142 condominiums. One of Boston’s most prominent hoteliers on Tuesday unveiled plans for a 33-story hotel and residential complex near Copley Square that would add another high-rise to the Back Bay’s skyline. Trinity Stuart LLC, a venture that includes principals of the Saunders Hotel Group, said the $225 million project will include a 220-room hotel with meeting spaces, 142 condominiums, 100 parking spaces, and multiple restaurants. The 400-foot tower is planned for the site of the former John Hancock Hotel & Conference Center on Stuart Street across from the Hancock Tower. 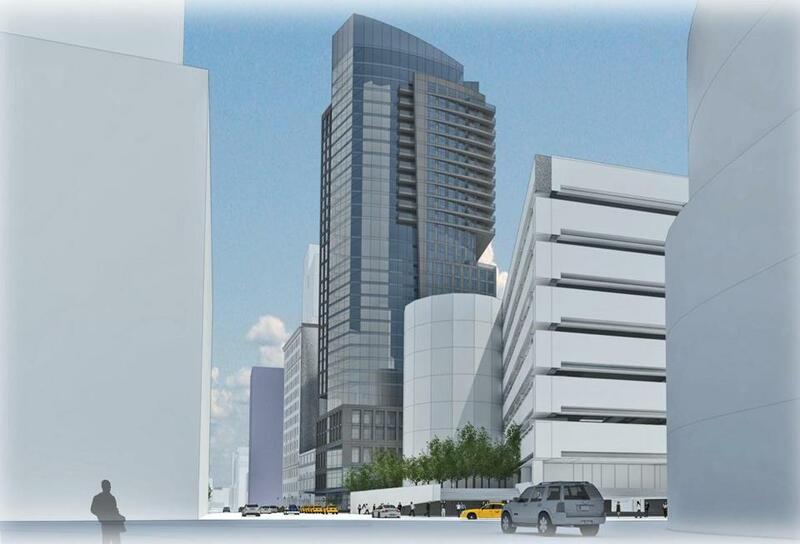 A rendering of the proposed building, designed by The Architectural Team of Chelsea, shows a slender glass tower with an angular top. The developers still need approval from the Boston Redevelopment Authority, but said they hope to start construction by next fall. The developers said they will demolish the existing eight-story building on the property and replace it with the 33-story tower, which will have a boutique hotel on the lower floors and condominiums above. The hotel will be designed by Stonehill & Taylor Architects, which recently drafted plans for the Nomad and Crosby Street hotels, both in New York City. Warshaw said the developers will seek “neighborhood-focused” restaurants offering lunch, cocktails, and nighttime dining. Part of the new tower will cantilever over the adjacent University Club, which will be given space in the building for an expansion. Trinity Stuart purchased the property last December from John Hancock Life Insurance Co. for $22.6 million. The partnership, which includes Jeffrey and Gary Saunders, is pledging to work closely with neighbors to help shape the project. If approved, the tower’s construction would add to the recovery of the city’s commercial building market, which has a number of large projects under development, including residential complexes in the Back Bay, Downtown Crossing, North Station, and the Seaport District. City and state planners in recent years have sought to encourage development of large-scale buildings in the Back Bay, at times clashing with neighborhood groups about additional traffic and the impact on public parks, among other issues. A neighborhood panel of residents and business leaders recently flagged the property as a site that could host a significant building of up to 400 feet, or between 30 and 40 stories, significantly taller than the 125 feet allowed under existing zoning. To qualify for the additional height, the developers must show that the project will not increase wind in the area or cast shadows on surrounding parks or historic structures, according to guidelines established by the panel. They also must commit to funding neighborhood improvements, such as public art or upgrades to nearby open spaces. The Trinity Stuart partners have significant development experience in the area. Warshaw previously worked under developer Ron Druker on the construction of the mixed-use Atelier|505 project in the South End, and the Saunders Hotel Group developed the Back Bay Hotel at the former Boston Police headquarters. The company also owns and operates the Lenox Hotel.